If it's Friday, it must be Offal of the Week! Brought to you by Ryan Adams, author of the blog Nose to Tail at Home, each week we highlight a different part of the animal that you've always wanted to work with, but were afraid to ask your butcher for. This week we're covering all of the must-have books on offal. Slowly but surely, offal is gaining acceptance again in the minds of foodies everywhere. But it can be a little intimidating to just jump in and start slurping up beef heart. 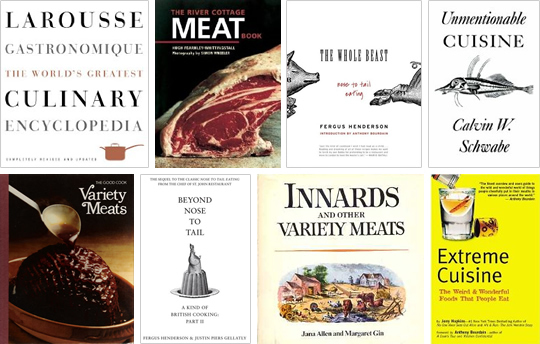 If you're looking to learn more about the fifth quarter — and with cold weather approaching, it's the perfect time to get into the braises and stewing that many of these cuts call for — these books make up my essential library — they're the best guides to get you started on your way to offal expertise. The book that started it all for me. It includes many of the dishes made famous by Fergus Henderson like the ubiquitous Roast Bone Marrow and Parsley Salad, Blood Cake and Fried Eggs, and Grilled Marinated Calf's Heart. Henderson writes his recipes in such a manner that you'll feel like a beloved family member is there with you, helping you along. A James Beard Foundation Book Award winner, this volume weighs in on most of the major offal cuts and includes many fine recipes as well. There is also a fantastic section on game which gives specifics on bird hanging. A must-have. Written in 1979, this book is an archive of some of the most unusual recipes ever written down. For example, on page 396 there are instructions for making fermented horse milk. Try finding that anywhere else. Part of Time-Life's "The Good Cook" series, I've heard many people speak of this book with reverence, even so far as to call it the offal bible. I too hold it in high regard thanks to its detailed information on how to find, buy, and prepare almost all of the items in the offal kingdom. Now out of print, finding a copy is getting harder and harder as people are wisely snatching them up. The sequel to 'The Whole Beast: Nose to Tail Eating', 'Beyond' focuses more on the baking and dessert side of things at Henderson's famous restaurant. But don't be fooled: with recipes like Deep Fried Tripe and Nettle and Snail Soup this book is still an important component of the offal canon. Another out of print gem, this book is chock full of interesting offal related recipes. When I find myself with an extra pig liver or lamb heart, this is the first volume I reach for. 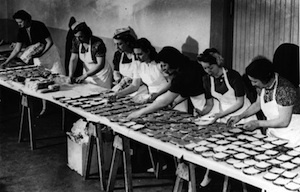 Background information and food history is sprinkled throughout to flesh out the book. This book deals with all of the off-the-wall food related items that one would expect to find on Zimmern's show Bizarre Food. It doesn't just tell you what people eat — it tells you why they're eaten. It's an important read for those interested in a cultural context for the consumption of offal. While the tome is being brought up to date, it's still a goldmine when it comes to information about offal and other unusual items. Even if you aren't a big fan of variety meats, this book should be on your shelf for easy reference. Every one of these books is an important part of my culinary library, and I heartily recommend all of them. I'm sure there are more offal related books out there, and if you happen to have a favorite that I didn't mention, please let the world know here in the comments. sorry, but what's the fuss all about? here in euope we have been eating offals since millenniums and we still enjoy them. i love tripes, hearts, andouillettes etc. The fuss is that most Americans have long forgotten the benefits and pleasures of eating the fifth quarter. As our culture became more of an industrial one instead of an agricultural one as well as "want based" instead of "need based" people forgot the importance of using the whole animal. Most people here think of offal as what is fed to animals if they think of it at all. Most of the people I know have no idea what the word offal means! Even the people I share my beef and pork orders with (I buy the animal and keep it in the freezer) have no idea usually when I ask if they want the organs and such. In Los Angeles, offal is starting to pop up on menus all over the city. From higher end French places like Bistro LQ and even more interestingly at the decidedly low end & touristy Gaucho Grill on Santa Monica promenade where they grill up some a lovely and generous portion of head cheese. It was delicious with simply some squeezes of lemon. Thanks for the list. I already have/knew of half the list and have now ordered some of these! Oliver, sadly zingzap is right. We're getting our act together. It's a little slow, but it's happening. FST, I'm happy to hear that LA is getting back into the good stuff. Hopefully it'll rub off on a few other places.